Baby Greens, Romaine Lettuce, Spinach, Spring Mix, Roma Tomatoes, Cucumbers, Red Onions, Carrots, Avocado, House-made Focaccia Bread. 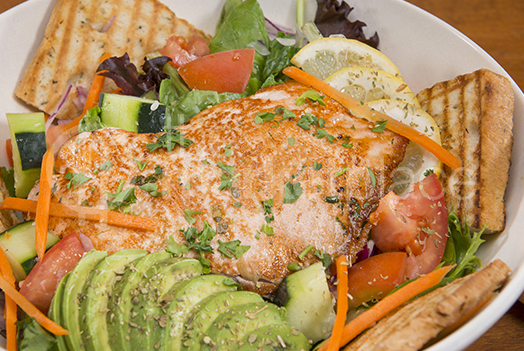 Served With Your Choice Of Cilantro Lime Vinaigrette Or Lemon Dill Vinaigrette. Veggie- Grilled Asparagus, Broccoli, Mushrooms, Squash, Zucchini, Bell Peppers. Quinoa (Hot Or Cold) – Tri-color Quinoa, Asparagus, Roasted Red Peppers, Sliced Almonds, Sheep’s Milk Feta Cheese, Green Onions, Topped With Parsley, And Accompanied With Sweet Mustard Dressing.